That Baldwin is beyond slick. Perspex lid! My friend's studio has a Virginal, apparently an early variant of the Harpsichord. 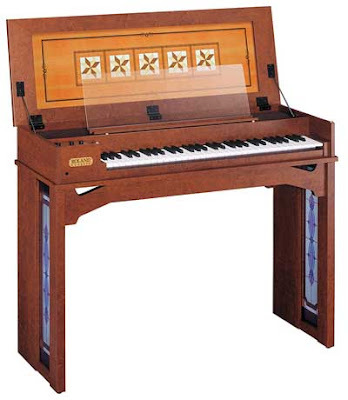 His is very small, almost like an overgrown Clavinet, but is fully acoustic, a real trip to play. Long time reader, first time poster. MT has been a big inspiration for my My new music/tech blog. Im not really sure why this really matters anyhow. Who the hell would want one. The Baldwin was a rockin' machine. It had magnetic pickups right across the whole range with separate pole pieces for each string. It did however require a considerable talent with a tuning hammer to keep the thing dialed into playable tune. This may surprise some, but there are a bunch of real life harpsichords "out in the wild" ... not in museums or music schools, but in folks homes. Check out this web page. The stained glass is kitch and anachronistic. The instrument plays and sounds well. Worth for lots of folks who live in small places or cannot afford the real 8-foot harpsichord.